Chevening has a history dating back around 800 years, but the house we see today is almost entirely the creation of seven generations of the Stanhope family, building on the original Lennard family’s house of around 1630. For 250 years the Stanhopes served their country as soldiers and statesmen, and at Chevening as patrons of architecture and art. When, sadly, the line ran out, the 7th Earl’s munificent gift of Chevening to the nation ensured that the distinguished history of the family and the estate was preserved for future generations. It is especially appropriate that the house has become the country residence of a Cabinet Minister and thus continues to play its part in the political life of the nation. 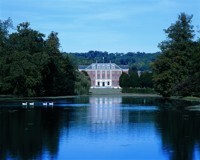 The Estate consists of some 3,000 acres stretching between Sevenoaks and Biggin Hill in Kent. The gardens include a lake, maze, parterre and a double hexagonal walled kitchen garden amounting in all to some 40 acres. Over 530 acres of mixed woodland surround the extensive park. Although the Foreign and Commonwealth Office’s (FCO’s) international awards programme is named after Chevening House, neither Chevening House nor the Chevening Estate has responsibility for the programme. The Chevening Awards programme began in 1983 and has developed into a prestigious international programme that is open to future leaders and influencers in over 160 countries and territories. The programme provides scholarships at higher education institutions in the United Kingdom for postgraduate students, and fellowships for mid-career professionals working in fields related to the FCO’s policy goals. The programme is funded by the FCO and partner organisations, and is managed by the Chevening Secretariat at the Association of Commonwealth Universities.